Samsung uploaded an event invite on its global newsroom suggesting a new smartphone which could come with four cameras or a smartphone whose camera may offer 4X optical zoom. At the starting of this month, famous leakster Ice Universe had posted a tweet in which the user wrote “Samsung” followed by “Camera Camera Camera Camera.” At that time, it was speculated that the South Korean giant would launch a new Galaxy smartphone with four cameras. 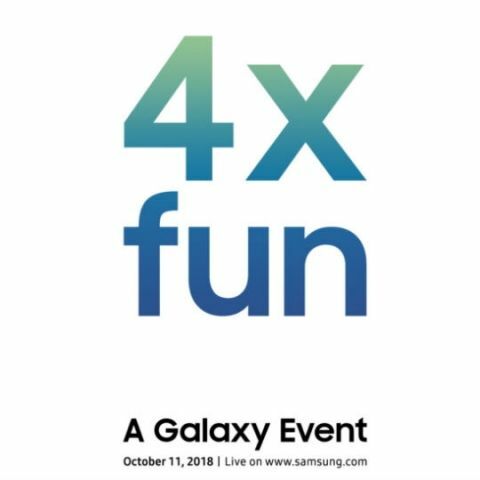 Samsung has somewhat confirmed the development by uploading an event invite which says “4X Fun”. Though the invitation gives the date of the event as October 11, it does not provide any information regarding the venue. You can watch the live stream of the event on news.samsung.com/global, www.samsungmobilepress.com, and www.samsung.com/galaxy. “Samsung’s newest Galaxy device is bringing more ways to express yourself than ever before. Capture the fun with Samsung as the company celebrates the launch of the new device with A Galaxy Event on October 11, 2018,” Samsung said on its website. It could be possible that the South Korean giant may incorporate two cameras on the front as well as at the back. Given that smartphone manufacturers are now resorting to three camera setups for better photography, Samsung may launch the smartphone with three cameras at the back. It could also be possible that the “4X” denotes the 4X optical zoom on the camera. We’ll have to wait to get some clarity on the development. There are already some reports which are claiming that Samsung, LG and Nokia may launch phones with five cameras. Samsung is also said to launch a foldable smartphone. During an interview in August, CEO of Samsung’s Mobile Division, DJ Koh confirmed that the company is developing a smartphone with a foldable display, called the ‘Galaxy F’ and is keen to be the first to deliver it to the market. Adding to this information, Koh has now hinted that more details of the device could be unveiled this year at the Samsung Developer Conference that will take place from November 7-8 in San Francisco.